A lack of budget negates action thus switching the focus on atmosphere and suspense that, in turn, are negated by the plot being so nonsensical and hokey. This is a reason why such movies are usually comedies. Built on a trashy foundation, a piece of art inevitably inherits inconvenient peculiarities, which, being ignored, clamp the author in a vise of his own irreconcilable artistic decisions, leaving the facade as the only possible merit. But still, the latter is a merit indeed. More of a suspenseful thriller than action movie, this gets to showcase the editing and cinematography skills of John Carpenter. The cast all know what they've signed up for as well and have some, but not too much, fun with the material. 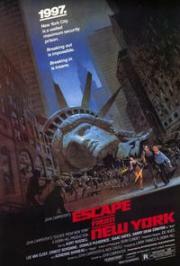 Snake Plisken is one of the coolest movie heroes ever, starring in campy 80's schlock at it's finest. Has loads of personality even despite its plodding pace, with a colorful cast of characters that play off of Plisken really well. The movie just exudes coolness, but at times I thought the film was lacking in excitement and relied too much on its atmosphere and absurd premise to maintain interest. A damn entertaining movie but not among Carpenter's best. I love that Carpenter just embraces the absurd premise with his typical no-nonsense direction. What I don't love is there's almost zero tension - come on, you're in the middle of a prison for the most dangerous individuals in society, and it never feels like things could go south at any moment. Carpenter was much more successful at this aspect only one year later, with The Thing. Everyone seems to love Russell in this, but I was honestly more impressed by Van Cleef. malum mgs hariç video oyun kültürüne set tasarımından hikaye detaylarına kadar büyük bir esin kaynağı oluşu dahi tek başına filmi sevme sebebi olabilir. tempo/denge problemi harici tam bir carpenter güzelliği.